Hand painted Pinecones and branches of Tan and Bark Brown with Pine Green needles against a Sky Blue ground, grace the Painted Pinecone Triple Vanity Lights distinctive glass shades. Hand painted Pinecones and branches of Tan and Bark Brown with Pine Green needles against a Sky Blue ground, grace the Painted Pinecone Triple Vanity Lights distinctive glass shades. 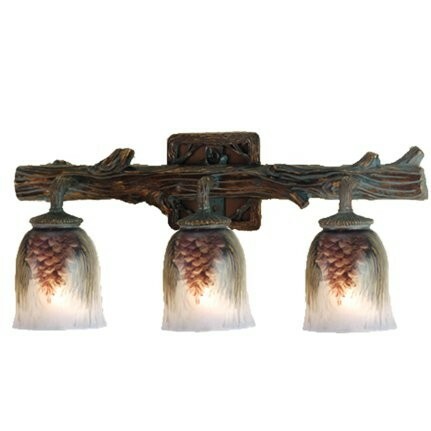 Three shades are suspended from a Pine branch detailed three light vanity in a Golden Pine finish.